Notes: In the 90s, Sir Patrick Stewart performed a one-man stage version of A Christmas Carol, which garnered great acclaim for several years. 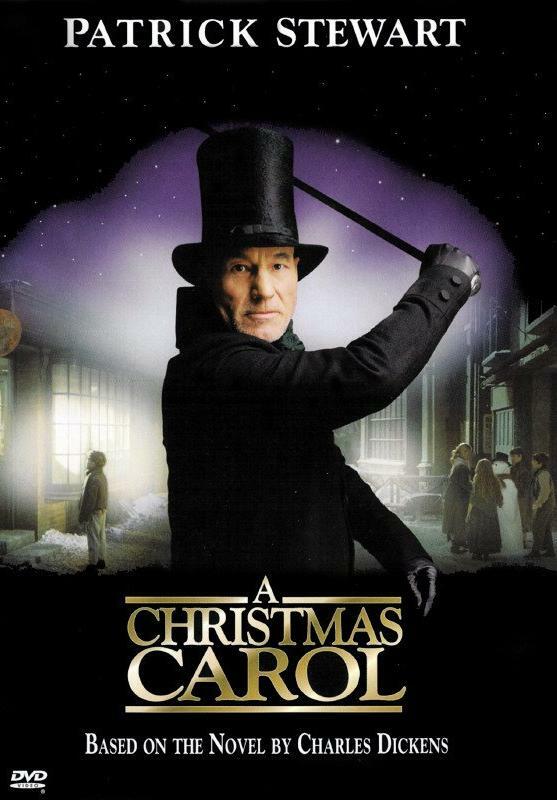 The TNT Network, recognizing a good thing when they see it, then produced this film starring Stewart as Scrooge. Stewart got a Screen Actors Guild nomination for best actor in a television movie or miniseries and both the movie and Stewart were nominated for Saturn Awards, the big prize for science fiction and fantasy. It’s a very straightforward version of the story, with the inclusion several scenes from the novel that many adaptations omit. Thoughts: Patrick Stewart rarely fails to bring the Awesome, let’s be honest. Even when he’s in a bad movie, he’s typically the bright spot in a miasma of mediocrity, and here I am specifically thinking of X-Men: The Last Stand. So it’s not surprising that in this made-for-TV movie, he puts forth a Scrooge every bit as powerful and definitive as Alastair Sim or Albert Finney. This film kicks things off with Marley’s funeral, a spot adaptations don’t cover that often, and from the start we see screenwriter Peter Barnes trying to bring in some of the Dickens language into the film. Although there’s no narrator as in the Muppets film, here we have some of the narration dropped properly into the mouths of Scrooge and others – the opening diatribe about why a doornail is considered particularly “dead.” When reading the book, that tangent in the first paragraph of the first page has always felt a bit odd to me. Here, it serves to show the mundane way Scrooge treats the death of his partner and sole friend. Much of the dialogue is verbatim Dickens, and Stewart delivers each line with the power and certainty that always drips from his voice. TV or no, this Christmas Carol has some of the most impressive special effects we’ve seen yet. Bernard Lloyd appears as Marley’s ghost: he has a spectral form, his hair constantly shifting as though blown by a breeze that doesn’t affect anything else in the room. At one point his jaw falls open in a rather hideous sight that probably gave the willies to a few kids watching this. On a performance level, this gives us the chance to see Scrooge interacting with that rarest of things for him – an equal. He speaks to Marley with a casual familiarity that we didn’t see as he spoke to Bob Cratchit (Richard E. Grant) or his nephew Fred (Dominic West). Even now, before his redemption has begun, we see that Stewart’s Scrooge is more layered than most of those who came before him. Joel Grey’s Christmas Past is perhaps my favorite of the human actors to portray the part. He has a light air about him, and constantly stands bathed in light. It’s a twist on the “candle” conceit that many versions go with, and it suits him nicely. He comes across as a little patronizing towards Scrooge, which the old codger sort of deserves at this point in the story. As Scrooge starts to feel the effects of his own past, such as when he sees his sister (Rosie Wiggins), we see the Ghost’s smile change from one of condescension to pride that he’s having the proper influence already. I haven’t said much about the assorted Fezziwigs in this project, because there’s rarely much to say. He’s the jolly shopkeeper Scrooge apprenticed under, he throws a slammin’ Christmas party every year, but he doesn’t have too much to do. Ian McNeice, however, really steals his scene this time around. The man brings so much joy and energy to the screen that you want to watch a whole special about him. Even his musical number plays the character as a sweet, good-hearted ham, like everybody’s goofy uncle that makes the same lousy jokes at every Christmas dinner, but you love him and you love them and it just wouldn’t feel like Christmas if they were missing. Even Scrooge himself defends the man with a real ferocity when Christmas Past dares to disparage him. Somebody at TNT take note, if McNeice is available and amenable, I want to watch A Very Fezziwig Christmas next year. Next it’s Desmond Barrit’s turn as Christmas Present, complete with the green robes and holly wreath. Barrit is a more low-key than most Presents. He’s not loud or bombastic, and in fact he seems almost sluggish as he walks around sprinkling his “milk of human kindness” onto the food of the poor. He doesn’t have the judgment of Scrooge in his voice that many people do, but rather a profound sadness. I’ve got to say, much as I like this version of the story, I’m not really keen on Barrit’s ghost. Christmas Yet to Come here is a shadowed figure with glowing embers for eyes. Of the ghosts in this film, though, it’s also the least convincing. The unaltered, human hands that reach out from beneath the robes to point Scrooge around are somewhat jarring, and only further serve to make you feel like you’re looking at a guy wearing a false head on top of his own like a theme park costume. The other ghosts, including Barrit’s, all have a sufficiently otherworldly (or at least Dickensian) look to them. Christmas Yet to Come looks like something a moderately-skilled cosplayer puts together on his weekend off. Fortunately, the rest of this sequence is considerably more effective. Scrooge’s pain when he realizes he’s watching the results of his own death comes across perfectly, with Patrick Stewart agonizing over the idea of looking at his own body and asking to see emotion connected to his death. From there we cut to a young couple rejoicing in that they’ll have time to get the money to pay their mortgage now – not exactly what Scrooge had in mind. The scene in the Cratchit home is a real gut-punch, as Bob talks to Tiny Tim’s body, still lying in his bed. It’s rare we actually see the dead child – most adaptations show Bob coming home from the cemetery or visiting the grave. Something about seeing him lying there makes the scene all the more heartbreaking. The Redeemed Ebenezer Scrooge at the end, like the bitter one at the beginning, is also a little subdued. Stewart doesn’t simply explode out of his bed, but he goes through some really clever ticks – touching his hand to make sure he’s corporeal, choking a bit before he remembers how to laugh and finally spinning into a man wrapped up with joy. Maybe my favorite bit comes when he asks the passing child to go and buy the turkey for Bob Cratchit, he actually has to take a moment to force out his newfound generosity. He’s made the decision to change, but just for a second we get a reminder that old habits die hard. Once he hands over the first few coins to the child, though, it’s like the dam has burst – he gives the man with the turkey extra money for a cab, walks through the streets depositing coins in the cups of beggars, and even engages the children in a snowball fight. He has to push the wall down, but when it’s down by God it stays down. Even then, though, it’s hard for him to knock on Fred’s door, and he almost passes by entirely. He’s willing, but ashamed at his past, and he has to overcome it. Bless ya, Sir Patrick, for making Ebenezer Scrooge a real human. Although this isn’t the best adaptation of the novel (as I said, the latter two ghosts were really quite weak), most of the performances are pretty good, and Patrick Stewart puts out one of the finest performances as Ebenezer Scrooge I’ve ever seen. It’s worth watching this movie for him alone.